While shopping at Sephora a few weeks ago, I found out that I had accumulated enough beauty insider points which qualified me to receive a 500 point perk. When I saw that the Josie Maran Argan Essentials set was up for grabs, I had no problem trading in my 500 points for it. I have been wanting to try out a few of Josie Maran's skincare products for quite some time now, so I am really glad that this lovely little set of best sellers gave me the chance to do so. Josie Maran's Argan Essentials set contains items that specifically help cleanse and nourish the skin. 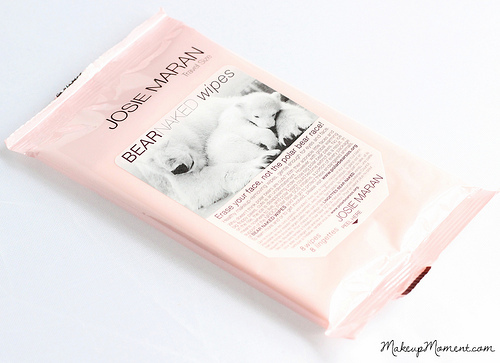 For the cleansing portion, we have travel sized versions of the bear cleansing wipes and the Argan cleansing oil. And in the nourishing corner is a travel size of the 100% pure Argan Oil, and a full size pot of the Argan lip treatment. Very nice assortment of products! Argan Cleansing Oil: This moisturizing cleansing oil not only helps remove makeup and impurities, but it also restores the natural moisture and pH balance of the skin. I have always fancied the idea of trying cleansing oils. I constantly read about how amazing they are for the skin. I haven't used this cleansing oil long enough to make a steady decision about it but so far, I really like it. I apply a thin layer of this all over my dry face, then I wet my face and start massaging the oil onto my skin, creating light milky suds. After I rinse and pat dry my skin feels super smooth, clean, and unbelievably moisturized. My complexion also looks a touch brighter, too. 100% Pure Argan Oil: I must say, this gem is the real stand-out star of the kit, and it has since become a lovely addition to my routine. 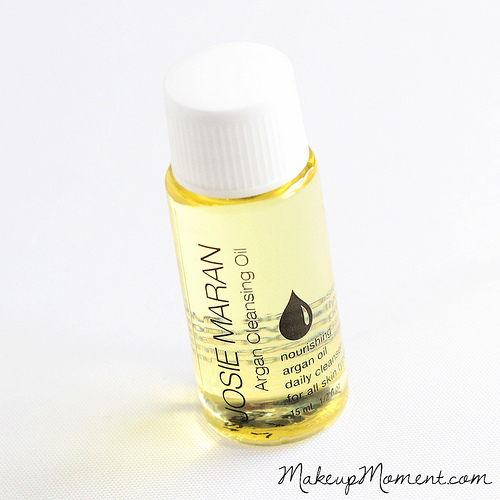 Josie Maran's 100% Pure Argan Oil is infused with antioxidants, essential fatty acids, and Vitamin E-all great skin protectors and nourishers. This multipurpose product is not only great for the skin, but for hair as well. A bit of this oil applied to my dry ends instantly softens them up, and a tiny drop mixed in with my facial moisturizer provides for an added moisture boost. I Love this stuff! 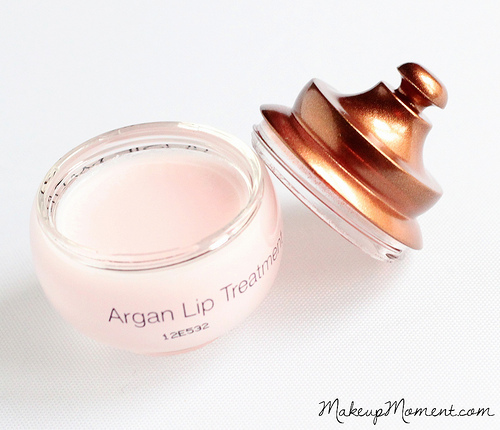 Argan Lip Treatment: First of all, how adorable is this pot packaging? It's certainly unique-in a good way, and it brings about an interest to the product. I do detect a sort of sweet fruit kind of fragrance to this age-defying balm, and I must say, I really like it. It doesn't linger for long though. Once the balm is applied to the lips the scent quickly disappears. Boo! This sheer lip balm may appear to be thick, but once it comes in contact with the warmth of your skin, the consistency results to be thin with a lightweight feel. It easily glides on the lips, and it gives off a shiny finish, like that of a gloss. After application, my lips look and feel so much smoother and healthier. I do have to reapply quite a few times throughout the day though, since this doesn't really last long on my lips. Bear Naked Wipes: These biodegradable wipes are infused with a variety of skin loving treats like aloe vera, cucumber, and Vitamin E. These are also free from parabens, and petrochemicals. The cloths contain a nice moisture content, and they are decently sized. One cloth is enough to effectively remove my face makeup; I don't use these wipes for the removal of my eye makeup, though. I prefer to use a separate eye makeup remover for that. These wipes feel gentle going on, and I love that these don't leave behind an uncomfortable residue on my skin. 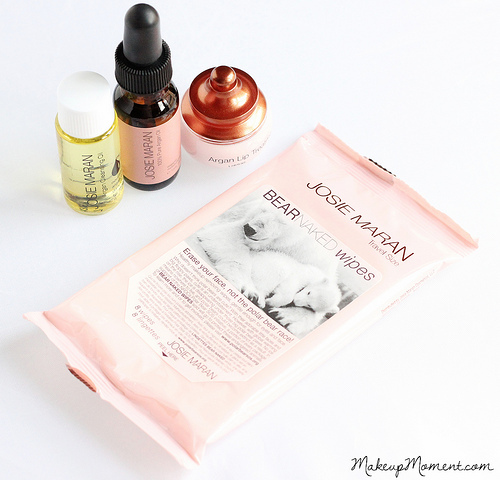 What do you all think of Josie Maran's Argan Essentials? 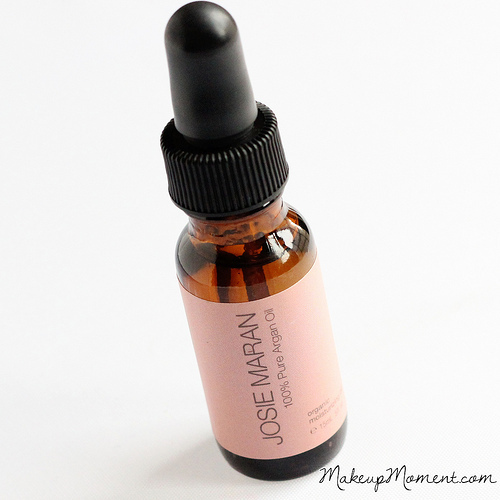 Which are your favorite Josie Maran products? Thanks, Jennifer! Glad you enjoyed it :) Have you tried any of Josie Maran's products before?